If you ever want to impress someone with your culinary skills, this would be the dish. It’s very easy and takes less than 30 minutes to make. Extract the crabmeat from shell. If you don’t like this part, you can buy pre-shelled crabmeat. Though, it will be more expensive. In a medium size bowl, combine: crabmeat, breadcrumbs, lemon salt pepper, cayenne pepper, parsley, dill, and egg. Use a wooden spoon and mix thoroughly — until all the ingredients are well combined. Divide the crab cake mixture into four servings, approx. 1/4 cup. Shape each serving into a round patty. Melt butter in a frying pan on medium-high heat. When the butter has melted and starts to bubble, add crab cake patties. Since the crabmeat is already pre-cooked, you only need to fry the patties for a few minutes per side or until golden brown. Make sure the heat doesn’t get too hot or else the butter will burn. When done, remove crab cake patties from heat and place on a paper towel for a minute to absorb any excess butter. In a small bowl, whisk all the ingredients until smooth and creamy. Place a crab cake patty on top of romaine lettuce. 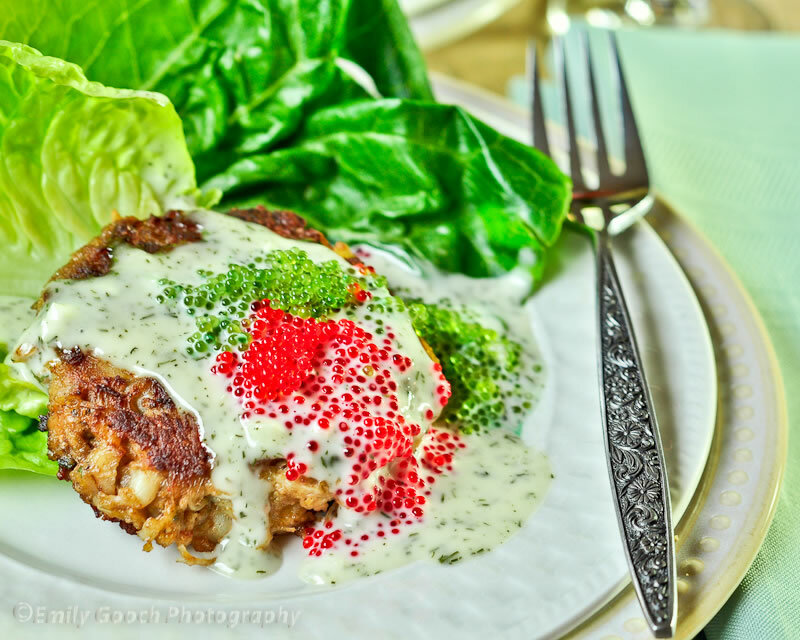 Drizzle a tablespoon honey dill sauce over crab cake and top with flying fish eggs. You can omit the flying fish eggs if you don’t like them. WOW… these crab cakes look incredible.